If you’re an avid reader of mine, you know that I am a religious Dr. Oz Show watcher. Not having the time to watch during school, where I am a Health Communication major, I came back to 21 episodes taped on my DVR! I am slowly getting through them. 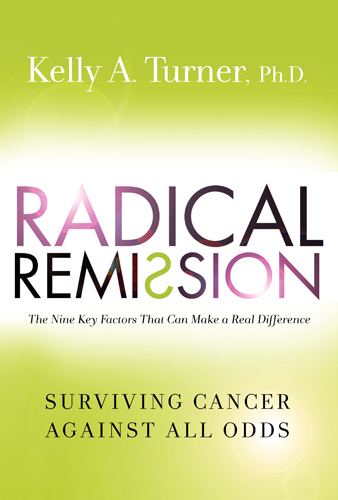 I need to share with you an episode I saw: The guest was Kelly A. Turner, Ph.D. and her book is Radical Remission – the Nine Key Factors That Can Make a Real Difference – Surviving Cancer Against All Odds. www.radicalremission.com. She found that there were certain people who beat cancer by NOT using conventional medicine. She wondered what the common thread was that ran through all these different people. It was quite intriguing. I went right to my library and got her book. I’m just in the first chapter, but it is so exciting that I’ve already contacted some acquaintances with cancer to tell them about it. My next stop was to tell you. Check out this book, and, as usual, I say don’t wait until you have cancer to make the changes!